Victoria is currently struggling through one of the harshest winters in recent memory. Unfortunately though, there’s more than your heating bill to be worried about. The harsh winds and drizzling rain can take a serious toll on your timber deck. But, with the right preparation, you can keep your deck spotless and strong throughout the colder months. Instead, use these winter months to service your deck while it’s not seeing as much use. Here’s an overview of some simple steps that will help to keep things looking neat and tidy while it’s cold outside. Decluttering is a fundamental landscaping principle. Cleaning your deck over the winter will be made a lot easier with some regular pruning of any overhanging trees and bushes. Your deck will always be the attention-grabbing centerpiece, but needs to be supported with a well-kept lawn. Tave a look at our Autumn landscaping tips for some additional pointers. Check between the crevices in the floorboards, under pot plants and any other unconventional spots that could be hiding any sort of debris. Pot plants in particular carry a lot of water that can leave marks on timber decks. So, be sure to remove these pots at the beginning of winter before they make a serious dent. Any organic matter that is left to decompose will stain your timber (in a best case scenario), or cause significant decay if left unchecked. Droppings from pets and stray birds need to be carefully monitored for this reason. They can make your deck look seriously shabby over time. Rinsing your deck is an optional step before staining. A good hose down will really bring out the shine in your deck. A powerhose or similar high-pressure cleaning tool will help you to achieve a really satisfying and deep clean. A powerwash on its own can be a good enough facelift on its own. However, the objective of this step is to prepare your deck for weather treating. A regular rinse with a soap solution will serve just as well if you don’t have a high-power hose. You can maximise a rinse by getting into the stains with a standard hard-bristle scrub. Household detergents like the ones used in laundry and dishwashing are just as effective as industrial strength cleaners (whilst also being a little bit safer to work with). Allow your deck to dry for about a day or two, depending on the weather and humidity. You want it to be dry to the touch before proceeding with the next step. After clearing your deck and letting it dry, it’s time to prepare your weather-resistant coating. You can test whether a new coat of stain and sealant is needed with a simple drip test. Simply drizzle water onto a couple of high-traffic surfaces on the deck. If water leeches into the wood, it’s time to refresh the coating. Local home improvement stores will have a range of great stains and sealers to suit the finish of your timber. If your timber has been treated previously and you’re unsatisfied with the finish and colour, you may want to strip it back. This can be done with a thorough scrub and some deck sealant remover. You’ll then need to rinse the residue away. This might seem like an unnecessarily tedious step. But, it’s worth considering if you want that picture perfect finish. Cover any areas that you don’t want stained with newspaper and tape. Apply the stain evenly to your deck with a brush. For larger decks, you may need a proper stain applicator. Work your way from one end of the deck to the other. Just be sure to leave enough space to let you wriggle out without ruining your work boots. As a rule of thumb, water based stains will only need about a day to dry. In comparison, oil based stains will take around twice as long to fully set. Go over the newly stained deck with the sealer of your choice, and allow for a day of drying before testing the results. By the end of this process, you’ll have a beautiful rich, earth-toned deck to compensate you for your efforts – too bad no one will really appreciate it until the summer rolls around! Your deck should be the centrepiece of your yard, and something that you can be proud of; on top of that, it’s a valuable addition to your home which becomes more valuable over time (with the right maintenance of course). 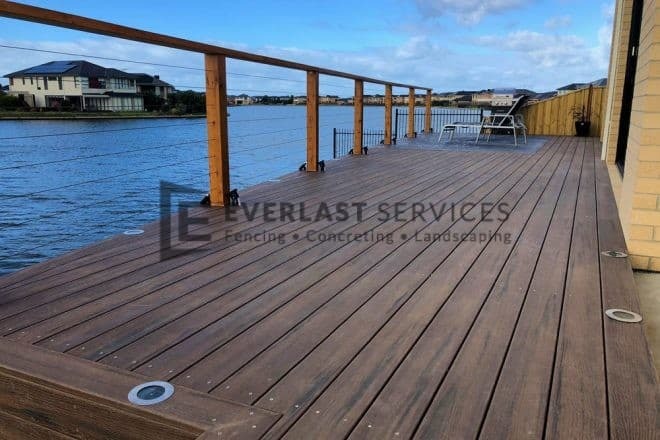 To learn more about maintaining sturdy and stunning decks, contact the experts at Everlast.